This page is Dedicated to All Our Blood Relations. Our Stone Family Ancestors were deeply grounded in Spiritual, Religious, Cultural and Family Traditions. Download Stone Family Photo Archives. All Stone Family Members lives are important and are welcome at our archives. All contributions, stories, letters, tapes etc.concerning our Stone Family will be accepted from Stone Family Members and the Public. Download the Updated Stone Family Tree. Password Required. 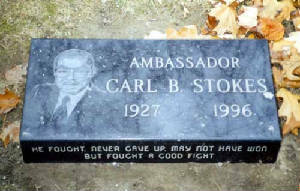 Carl B. Stokes Lake View Cemetary Cleveland, Ohio. We Provide A Virtual Place To Memorialize & Pay Tribute To Family, Relatives & World Wide Friends Of The Stone Family. FYI: ALL Links Below Open In A New Window For You. Family supporting Stone Family Memorial Dedications may be enter here upon request. We ask you to make a heartfelt financial or in kind donation. Please fill form below, click send & forward all Memorial Dedication Requests. Financial Donations may be made separately by Credit Card PayPal Payment. We would like to have all Family Events surplus proceeds and family donations to be used to help maintain this Internet site fees, to build a Memorial Scholarship and Burial Upkeep Fund for Our Stone Family Members Cementary in Wrens, Ga. Become a Supporter and / or a Benefactor. Your Contributions Can Make a Difference! We Thank You for Your Generous Financial Support. Anonymous Donations Accepted.